Frankenstein; or, The Modern Prometheus, Mary Shelley’s epic tale about the perils of scientific creation, turns 200 this year. Its famous creation story involves laudanum, and sexual tension, and an air of scandal: Mary and Percy Shelley, her poet-atheist-firebrand-lover and their infamous friend Lord Byron were figures of great interest and consternation in 1816 Britain. Cooped up in a lakefront mansion amid unseasonably chilly, dreary summer weather, the trio and their friends spooked one another with German ghost stories and embarked upon a dare that inspired Shelley to create the modern myth that became Frankenstein, published on January 1, 1818. Two centuries later Frankenstein is the fifth most assigned book in college courses, there’s a fresh round of new film adaptations currently in production, and Franken Berry cereal is back on grocery store shelves for Halloween. Frankenstein’s creation still walks among us as we continue to struggle to absorb the lessons of Shelley’s complex fable about science and society. Part of what gave Frankenstein’s “monster” its long life was its early and memorable adaptation in theatre and movies, which told a simplified tale about the dangers of hubris, a warning against science and innovation out of control. In this telling, Victor Frankenstein’s creature is an ungodly creation and the results of the experiment are predictably calamitous. Frankenstein was trying to play god, and he went beyond the bounds of acceptable scientific ambition. Of course people died. All of the familiar images around pop culture adaptations of Frankenstein—the thunder and lightning, the white coat, the ornate steampunk machinery, the maniacal cackling—encourage us to think of this as a story about hubris and its rewards. But the reality of Shelley’s novel is far more complicated. Frankenstein is a nuanced exploration of scientific ethics and the dynamic between scientific creativity and social responsibility. The novel isn’t a straightforward warning to stop innovating; it is a cautionary tale. The dangers aren’t so much about what we do, but how we go about doing it. Frankenstein’s creature isn’t born evil. He only becomes vengeful and violent after Frankenstein abandons him when he’s prelingual and vulnerable. The descent into wrath is accelerated by the rejection the creature encounters time and time again as he tries to forge human connections with people who are horrified by his gruesome appearance. Frankenstein fails not as a scientist, but as a parent. 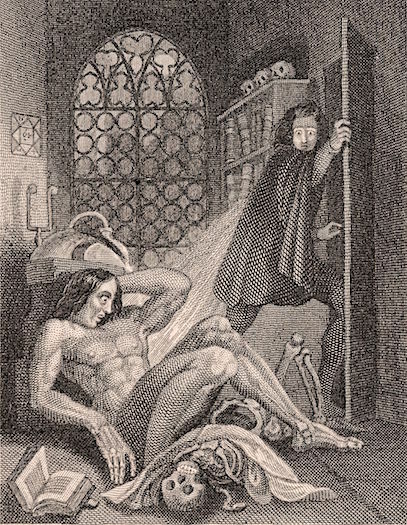 Frontispiece to the revised edition of Frankenstein by Mary Shelley, 1831. Shelley’s narrative urges us to be good caretakers of the new things we bring into the world, whether they’re ideas or works of art or gadgets or synthetic beings. The novel cautions us that human creativity begets things of great power, and dramatizes what happens when a creator significantly shirks his responsibility. Frankenstein’s penchant for the bombastic, and his definition of science as a pursuit of glory, is reminiscent of the spectacles of Luigi Galvani (1737-1798) and his nephew Giovanni Aldini (1762-1834), who thrilled crowds across Europe by using electrical stimulation to make dead animal and human tissue twitch and convulse as if imbued with life. Shelley’s novel distinguishes between practical science, with modest ends and clear applications, and Frankenstein’s Promethean ambitions, which are awe-inspiring endeavors but lack an obvious pathway to improving human life. I sometimes like to think of Shelley’s novel as a science policy novel rather than a science-out-of-control novel: It admonishes us to build a social context wherein our creations can flourish and improve people’s lives. The story of Frankenstein’s famous creation encourages us to think carefully about the consequences of just dropping something into the world without a carefully thought-out plan for its oversight, growth, and maintenance. In writing the novel, Shelley made a series of deliberate decisions to encourage us to adopt this more nuanced reading, and not spring for the simpler warning about hubris. When I first read Frankenstein, after a few pages I turned back to the battered cover of my library copy to make sure I was reading the right book. Where were the secret lab and the mad scientist and the hulking, bolt-necked monster I knew from the movies? The creature that Shelley imagined is nothing like his mute, clumsy, Hollywood and Halloween monster cousins. Her creature is articulate and sensitive, a self-taught Romantic intellectual who agonizes over his violent acts and marshals philosophical writings and John Milton’s Paradise Lost to justify and give meaning to his desperate quest for revenge and wholeness. Reading the creature’s tale, it’s difficult to see the decision to create him as purely a mistake; he is thoughtful and perceptive about his experiences, and clearly traumatized by his abandonment, rejection, and loneliness. Frankenstein fails to create a context in which the creature could thrive, so he becomes wounded, and his grief and isolation warp into rage and violence. This is a survivor of abuse, not an ungodly horror. It would have been easy to have the entire novel emanate from Frankenstein’s perspective, and it would have given readers an ethically cleaner takeaway about the price of ambition and scientific overreach. Instead, Frankenstein forces us to reach our own conclusions about how much slack to cut the characters, to decide how fault and responsibility should be apportioned for the novel’s many disasters. It’s an ethical puzzle, not a didactic treatise about how to do science correctly without going too far. Shelley built that fuzziness into the structure of the novel. We’re still grappling with these same issues of creativity and responsibility—even if our scientific knowledge and technological sophistication are far more advanced today than in Shelley’s early 19th century. In an age of obviously Frankensteinian breakthroughs in genetic engineering, artificial intelligence, and social robotics, we’ve already answered the simpler question—we’re being hubristic, in some sense, playing with the forces of life and death. What remains is the deeper lesson at the heart of Frankenstein: That the thrill of discovery is just the beginning of a creator’s work. 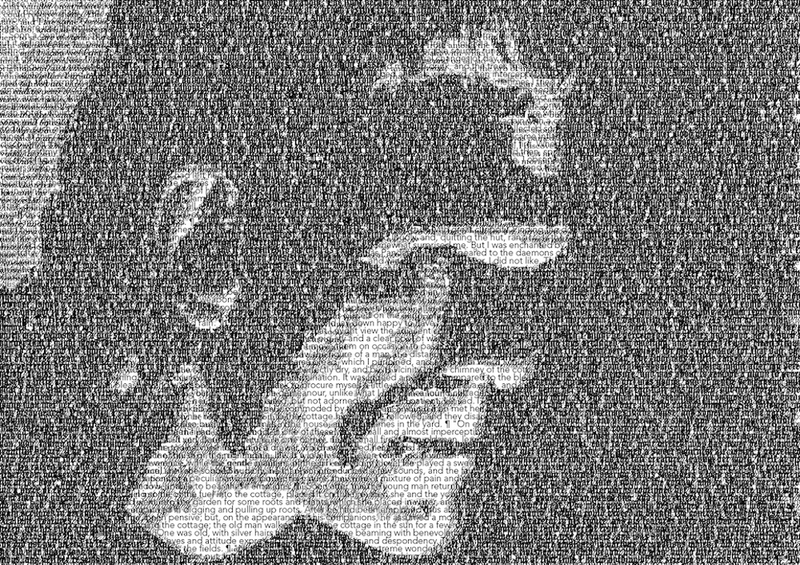 At the Frankenstein Bicentennial Project at Arizona State University, we’re trying to encourage a new round of reflection and creativity about this infamous “monster” and his maddeningly unreliable creator. Through 2018 we’re hosting film screenings, museum exhibits, panel discussions, and other projects as well as publishing a new edition of Frankenstein tailored for emerging scientists, and engineers. The aim is to explore our evolving relationships with science and technology, and contemporary interpretations of monstrosity. Today’s Frankensteinian quandaries about creation and its consequences confront us at every turn, from GMOs in our breakfast cereal and political Twitter bots to the self-driving cars with whom we’re already beginning to share the road. If we want happier endings to these stories, we need to take our responsibilities as creators seriously, and offer all of our creations the care and respect they need to flourish. Joey Eschrich is the editor and program manager for the Center for Science and the Imagination at Arizona State University. He is the co-editor of Everything Change: An Anthology of Climate Fiction (2016). *Lead image courtesy of Nina Miller. Interior image courtesy of Tate Britain/Wikimedia Commons.